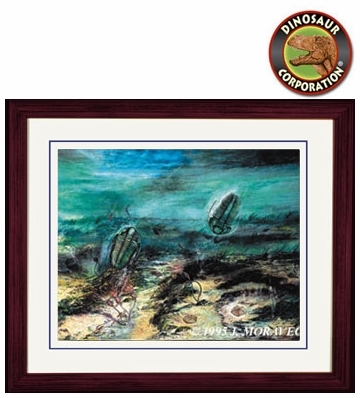 Cambrian Framed Picture 16" x 20"
Home | DINOSAUR PAINTINGS | Cambrian Period | Cambrian Framed Picture 14" x 17"
Cambrian Framed Picture 14" x 17"
Cambrian by Josef Moravec. Framed Cambrian Picture in 14" x 17" is double matted in glass. The Cambrian Period was the first geological period of the Paleozoic Era, and of the Phanerozoic Eon. The Cambrian lasted 55.6 million years from the end of the preceding Ediacaran Period 541 million years ago to the beginning of the Ordovician Period 485.4 mya. ▪ Cambrian Period Picture Art Print, 16" x 20"
▪ Cambrian Period, Cambrian Picture, 20" x 24"
Cambrian Period Picture Art Print, 16" x 20"
Cambrian Period, Cambrian Picture, 20" x 24"